One of the Hyundai Help for Kids Lions Academy under 15's players has been awarded the Troy Clarke Scholarship for 2016. Wide Bay’s Bruce Reville has been awarded the 2016 Troy Clarke Scholarship, named after the former Brisbane Bears player and respected AFL Queensland Game Development Manager who passed away in 2013 at just 44 years of age. The scholarship is designed to support a young person from regional Queensland each year, who displays the same core values – such as dedication, passion and respect – that Clarke embodied throughout his life. Like Clarke, Reville’s passion is AFL and his dream is to play at the highest level. He plays club footy for the Maryborough Bears and is a member of the U15 Wide Boy Schoolboys Team. He competed for Queensland in the National Diversity Championships in May; his performance across the carnival so good he was named in the World Team to compete at the National Under16 Championships in July. As well as striving to improve his own game, Reville also helps out at a local primary school with the coaching of their girls’ team. Speaking at the announcement, Reville said the scholarship would go a long way to furthering his football ambitions. “Ever since I was a young boy I have had the dream of becoming a professional AFL player and I feel this scholarship is that one step further for me in that direction,” said Reville. 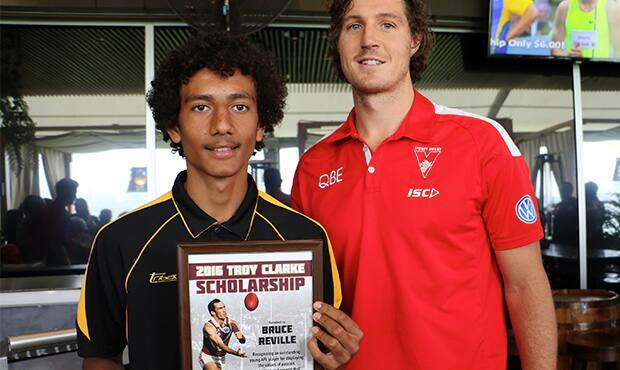 Reville was presented with the award from Troy Clarke Scholarship Ambassador Kurt Tippett who spoke fondly of the late Clarke. “Troy had a huge influence and impact on me when I started playing the game. It was at the end of high school, 2004, when I met Troy down there on the bottom oval,” said Tippett. “His infectious smile, he always taught me, made it fun, and really, he is the reason I'm playing footy. I’ve been lucky enough to play at the highest level for 10 years, and I’m so grateful for it. “His encouragement, his love for the game, his passion gave me the energy to explore it, and want to enjoy it as much as he did. The scholarship will help Reville further his dream of playing in the AFL by assisting the financial costs associated with his representative program. He will also receive one-on-one mentoring from Kurt Tippett.